Hulu is cycling through Saturday Night Episodes. I may have seen this one when it aired, but not sure. Maybe I watched it with my eyes closed as I sometimes do. Either way, I saw this tonight and the performance was great. Plus, Tom Hanks was the host and he is just the type of person that the world needs more of. When I got home yesterday after work, Charlie was excited to see me. Unlike the last few days with him being somewhat distant, he stayed close to me and gave me kisses and, after he ate his dinner, he came up on my bed with me. While his head was laying in my lap, I patted and rubbed his head and ears and paws and told him that this was our last night together. I cried quite a bit and talked to him. He seemed normal, hardly coughing. I questioned myself again on whether or not I was doing the right thing. They showed up promptly at 9am. I wasn’t ready. I asked for five minutes. Then they injected him to relax him and waited 10 minutes and then injected him with the final injection. It took less than a minute after that and he took his last breath. I didn’t expect it all to go so fast. Lucas and I cried the entire time. Marcie was also there and it was so awesome that she took the time out to come by and say goodbye to Charlie. 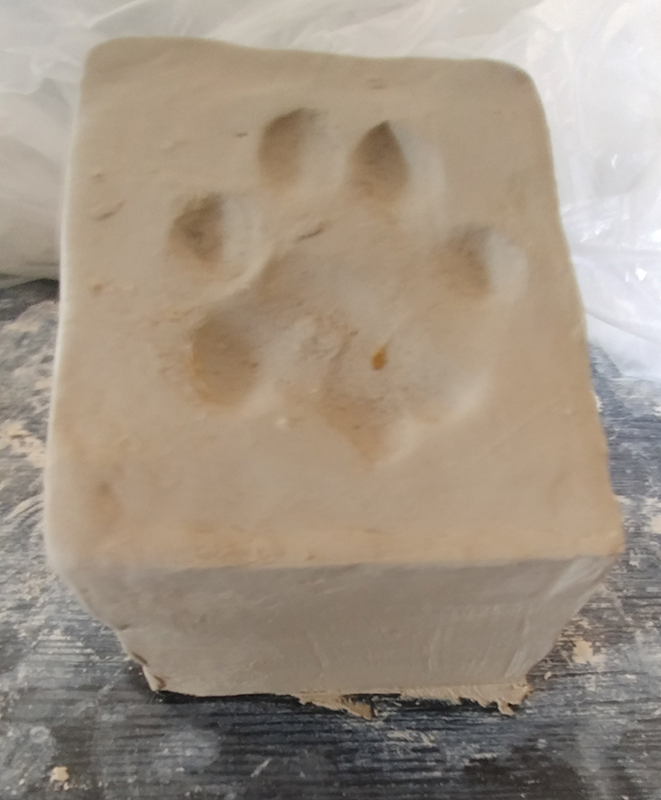 After Charlie’s last breath, Lucas pressed his paw into clay so he could make a box for his ashes with his paw print on top. It is now 3pm and he has been gone for over five hours. My head hurts and I cannot cry anymore today. The vet called this morning about the results of the specialist looking at his x-rays. I didn’t expect anything to be different and I really know that he is at the end of his life, but hearing it made it more certain. His trachea is collapsing and he is dealing with a COPD type of issue that pretty much means end of life. It is not recommended that we let him die naturally as that will mean suffocating to death. I called the mobile euthanizing vet to come on Friday morning to end his life. The vet explained to me that this is the humane thing to do. I am confused why it is “humane” to end an animal’s life to prevent suffering, but NOT “humane” to end a human life to prevent suffering. This is where my reluctance comes from. I have witnessed a human taking the last breath, but it is not pretty and the days and months leading to it are hard on everyone…especially the dying human. Yet, we have no choice…it is the way. And with a pet, that is part of the family and considered just as important and loved as any human member of the family, why can we simply decide when that pet should take his last breath. Why is it that we get to play God or Mother Nature and decide that this furry family member has lived long enough? What doctrine in history or the beginning of time stated that we can forcefully end the life of certain creatures but not humans and label it a “humane act”? Either way, it seems that Charlie is going to suffocate to death and that is considered to be such a terrible way to die that I should call it and take his life. Even though he and I just ate pizza together and he still eats and drinks and goes outside to enjoy a cool breeze and he still follows me around and seems to be happy at least some of the time. If it were a human, we would take all of that as signs that there is still a lot of life in the person. Yet, everyone keeps telling me that I am doing the “humane” thing by putting him out of his suffering and that he has lived a longer life than most dogs like him would have and that I should just release his soul and end his suffering. It doesn’t seem that anyone else sees my point of view in this. Why is that? Charlie is dying. He is fifteen and a half years old. I guess that is about 110 in dog years. It is quite remarkable. This past month has been a series of downs and ups and downs. About a month ago he started coughing quite a bit, but still fine otherwise. I took him to the doggie doctor and we did x-rays. The cloud from his pneumonia six years ago was more pronounced and his heart was somewhat enlarged. These were all things that the doctor seemed to find normal for his age and such. Antibiotics were given and he began getting them each day. Then, on July 4th, my birthday, we had a get-together at the house. His cough was worse that day and his breathing had become crackly. People talked to me about the inevitable. I told them all that he would be fine…he is just settling into the anti-biotics and getting all that ick out of his system. On July 5th, I called the vet and asked her opinion. She suggested a different antibiotic. So that night, he started the new antibiotic. The next day, he was barely coughing, which was a great sign. However, the day after that, his coughing was worse. The vet said to give it a week. So today, we went to the vet again and did new x-rays. They were very concerned at the progression of the lungs and trachea in the new x-rays compared to those of a month ago. 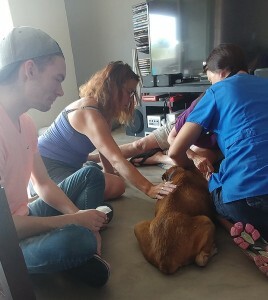 The fact that he is going to die within the next week became clear, and I cried many tears while a fantastic doggie doctor who really cares seemed to look for every possible way to help him. We decided together that the goal is to get him comfortable. He is going to die, that is a fact. It might even be today or tomorrow, but definitely within the next seven days. So we have some meds to keep him relaxed and comfortable. Charlie and I went home and I let him up on my bed with me and he put his head in my lap. I talked to him about the period of time when he first came to live with us and he was about three months old and he always wanted to be in my bed and I always told him to get down. Now, fifteen years later, I was so happy to have him in my bed, his head on my lap, reminiscing about all of the cool experiences he has had in his life. I cried so much talking about it all, knowing that his ears stopped working over a year ago and he probably cannot hear me, but maybe he could at least feel the vibrations of my voice as he lay in my lap. I had a jar of peanut butter and two spoons and he perked up as soon as I opened the jar and his sniffer caught the scent. We ate some spoons of peanut butter together and really had a nice time hanging out. 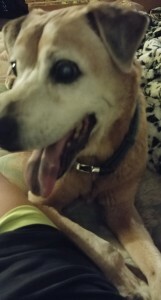 I think he is the most amazing dog with a most amazing life and I am so grateful to have been a part of it for 15 years and for my boys to grow up with Charlie. He crossed this country from coast to coast twice; he put his feet in two oceans as well as the Gulf Of Mexico in every state that borders it; he slept with the boys and I on the beach in San Diego; he went camping several times and was the absolutely the most amazing camping dog; he went each year to find a Christmas Tree with us in the forest; he understood english better than many humans and, after his ears stopped working, he quickly learned lip reading and hand signals; he never left my side given the opportunity and always made sure he had me in his sights when we were anywhere; he had a thing for bread and we had to keep the loaves out of his reach; he knew right from wrong very well and always had that look on his face when I came home from work and he had done something wrong (like steal the loaf of bread off the counter); he got to jump on the trampoline with the boys; one of his first furry best friends was an adopted cat named Becky who came with the house we bought and taught Charlie many things; his second furry best friend was a dog named Shadow who’s human was my best friend Karl; both Becky and Shadow passed away years ago…Charlie The Bear Killer just kept going in spite of pneumonia in 2011 and getting recurring pneumonia symptoms year after year. But now he is nearly 16 years old and his body just isn’t strong enough anymore. He had a great run and is being tough now too. I wish he would let go because I have cried my eyes out, felt my heart break, and now I know that he just needs to fall asleep and when he lays here and looks at me with that look like I am the most important being in his world, I just keep trying to look back at him with assurance that it is ok and he can let go. For months that turned to years, I have thought about writing. However, June 21st, 2013 seemed to change my ability to bring myself to write. Well, here I am…trying to bring myself back to the basics of writing and letting out my thoughts. I doubt anyone reads this blog that I put in place approximately 20 years ago. So, I figure I can just write and say whatever I want here. haha. I guess I better sum up events during my absence. My sister took a really expensive helicopter ride to a hospital in Scottsdale on June 21st, 2013 after bashing her head into a brick wall after being catapulted from a motorcycle. They had to remove part of her skull to release the pressure, put some screws in her back, rebuild part of her face and clavicle, and she spent several weeks in a coma followed by learning to walk, talk and eat again. My Mom and I spent every day at the hospital with her. Nothing has been the same since. Life had become quite wonderful prior…great career with a nice amount of travel and promotion, a wonderful guy that I spent about 18 months with, renovating the house, and a garden that I was proud of… well that all changed pretty quickly after my sister’s accident. For the most part it didn’t matter. Nothing was more important than figuring out the best way to do what needed to be done for my sister and family. We moved her into the house and took great care to set up her new bedroom exactly the way she would and making sure to put all of her cherished books on her shelves in exactly the order she would. We were very excited to try to give her that familiarity. Approximately 14 weeks after the accident, she came home. We tried a home health care person to be with her while we were at work. That didn’t work. My sister’s brain doesn’t work the same anymore and the unfamiliar stranger in the home with her just made things worse. She was determined that it wasn’t her home and this person shouldn’t be there and it was just tough. So, Mom and I took turns being home and worked our jobs in a way that I could work from home when Mom was at work and then she could be home when I was at the office. This was tough. Well, long story short, my son and I moved to a different house to keep things as calm and consistent for my sister as possible at home. Mom and I left our jobs and we all opened up a little shop so that we could take care of my sister and work at the same time. Four years later, here we are. I have so many thoughts that go through my head that I just want to write again. So, hopefully this entry will open that door for me again. Wow!!! This is awesome!! One day I will once again find a dance partner. I miss those days. But this was amazing and made me so excited for Jana and Gleb!! Loved every minute of it and well deserved of the 40 score they received!